The Chicago Sky made a valiant comeback to lead in the fourth quarter of this game. But it was not enough for them to win the game, and prevent a sweep at the hands of the Phoenix Mercury. 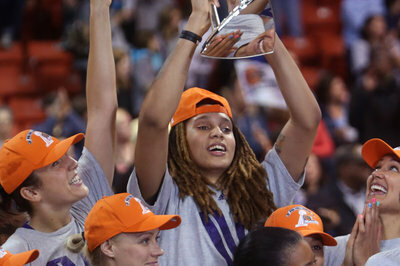 The Phoenix Mercury won Game 3 of the WNBA Finals by defeating the Chicago Sky 87-82. With the win, the Mercury wins the 2014 WNBA Finals, their third title in franchise history. Though the Mercury won this game and swept the Sky, Chicago didn’t go without a fight. In the third quarter, Sky led by as many as four points, 63-59 after holding the Mercury to just 36.8% shooting from the field, but Phoenix foward Candice Dupree made the last bucket before the period ended. So Chicago entered the fourth quarter only ahead by a score of 63-61. Jessica Breland was called for a technical foul with 8:51 left in the fourth quarter after slapping the ball away which hit DeWanna Bonner in the face. From there Phoenix made a quick run to reclaim the lead. Though Sky guards Courtney Vandersloot and Allie Quigley made some late buckets, to tied the game 82-all with 33 seconds late, Mercury guard Diana Taurasi made the go-ahead shot with 14 seconds left, and pulled away with the win. She scored 24 points in the game, where she surpassed Deanna Nolan as the all-time leading scorer in WNBA Playoffs history. After the final buzzer sounded, the WNBA announced that Taurasi won the 2014 WNBA Finals MVP award. This was the second Finals MVP honor in her career. Head Coach Sandy Brondello won her first title as a coach. She also is the first former WNBA player to win a championship as a head coach. Brondello played five seasons in the WNBA, which included stints with the Detroit Shock, Miami Sol, and the Seattle Storm. The Chicago Sky made a valiant effort, but it was not enough. The Phoenix Mercury had too much for them to overcome; the efficient scoring of Diana Taurasi and Candice Dupree, along with Brittney Griner’s defensive presence was too much to overcome. Congratulations to the Phoenix Mercury for winning the 2014 WNBA championship, and congratulations to the Chicago Sky for their Eastern Conference Championship. Candice Dupree also scored 24 points in the game on 11-16 shooting for the Phoenix Mercury. Dupree also led the Merc in assists with six for the night. 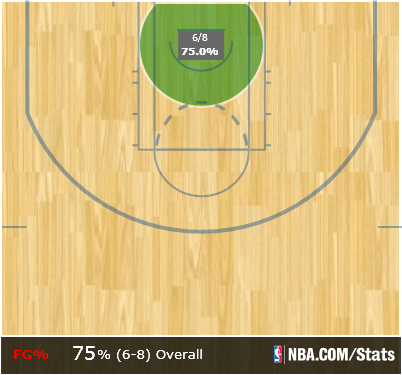 You would think that without Brittney Griner, the Mercury may not be as strong of a shot blocking team. They still nine blocks in game three. Ewelina Kobryn, who started in place of Griner had three of them. The Sky as a team only had four. For the Sky, Elena Delle Donne led their scorers with 23 points. Sylvia Fowles was second in scoring with 20 points, but did not get going throughout the third and fourth quarters. Allie Quigley scored 19 points and at times, she appeared to be the go-to player for this team. Quigley certainly had an excellent season this year, but for whatever reason, the Sky did focus the offense enough for Fowles to be involved, especially on a night where Griner wasn’t able to play the game. Courtney Vandersloot had a great night passing the ball where she had 11 assists. This could have been a bigger story in the game if the Sky won, but with the exception of her, no other Sky player dished more than two assists. For the Mercury, four players had three or more assists, so the ball was moving more freely for Phoenix.